EnhanceTronic is a program that is going to render various advertisements automatically once it gets onto your computer. All these deals, coupons, and different pop-ups will not leave you alone unless you remove EnhanceTronic from your system. You should also know that there are many similar programs out there; thus, we recommend avoiding Cling Clang, TronTizer, and the like. They will all display annoying advertisements which you will not be able to get rid of so easily because they are compatible with all the most popular browsers, including Internet Explorer, Google Chrome, and Mozilla Firefox. You should still not keep EnhanceTronic onto your computer because you will be forced to experience the undesirable activities that it is going to perform. This program is nothing more than an advertising-supported program whose main purpose is to promote various services and products as well as generate traffic to particular websites. When you click on those ads, the publishers of EnhanceTronic receive money for your clicks. The best solution is to erase this program entirely if you do not think that such activities are fair or if you do not want to be a part of this. What is more, all those promotions might be rather dangerous in a sense that they might take you to the websites that contain malicious software. You might not even suspect that you have ended up in the corrupted website and thus you can easily infect your system. Our specialists recommend ignoring all the material presented by EnhanceTronic. The last suspicious fact about EnhanceTronic is its collection of non-personally identifiable data. You might say that such information is not important; however, some people might still think that such information as the browsing history, the time they spend on particular websites, and the particular content that they access is too personal. If you do not like this gathering of data, you should erase EnhanceTronic entirely because you will not be able to stop it in any other way. If you are ready to get rid of EnhanceTronic, you can use the instructions that we have provided for you below. 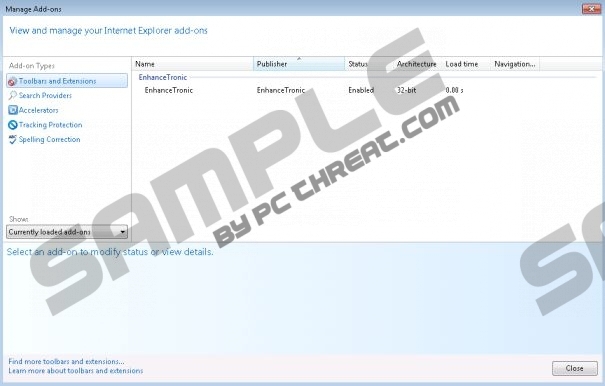 The automatic remover SpyHunter will also detect and remove this advertising-supported program; thus, you should choose whether you want to delete it manually or automatically. If you choose the second variant, you will not need to worry about the security of your system in the future because this antimalware tool will keep your system safe. Locate EnhanceTronic on the list and right-click on it. Press the Windows key and you will access the Metro UI menu. Move your pointer to the lower-right corner of the screen. When the Charm bar appears, select Search and type in Control Panel into the search box. Quick & tested solution for EnhanceTronic removal.